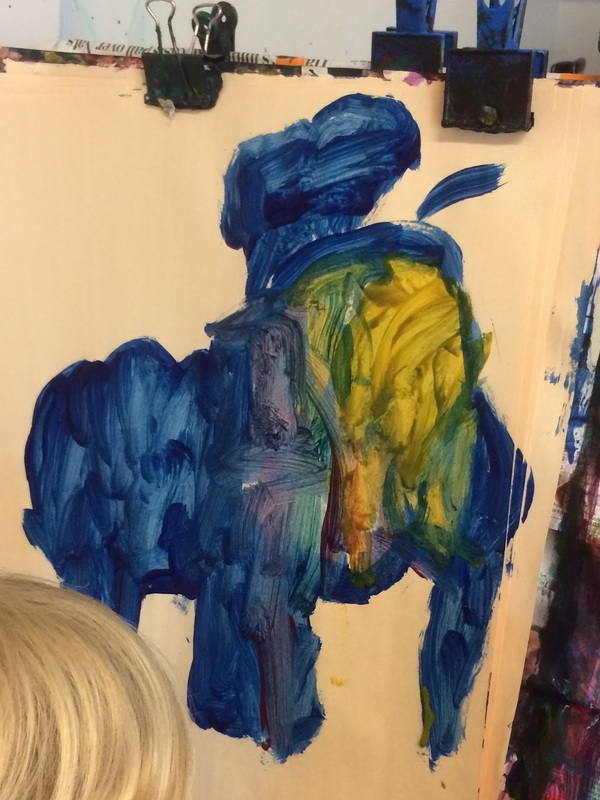 Pondering Preschool: Tuesday SOL: What if we paint at the easel? 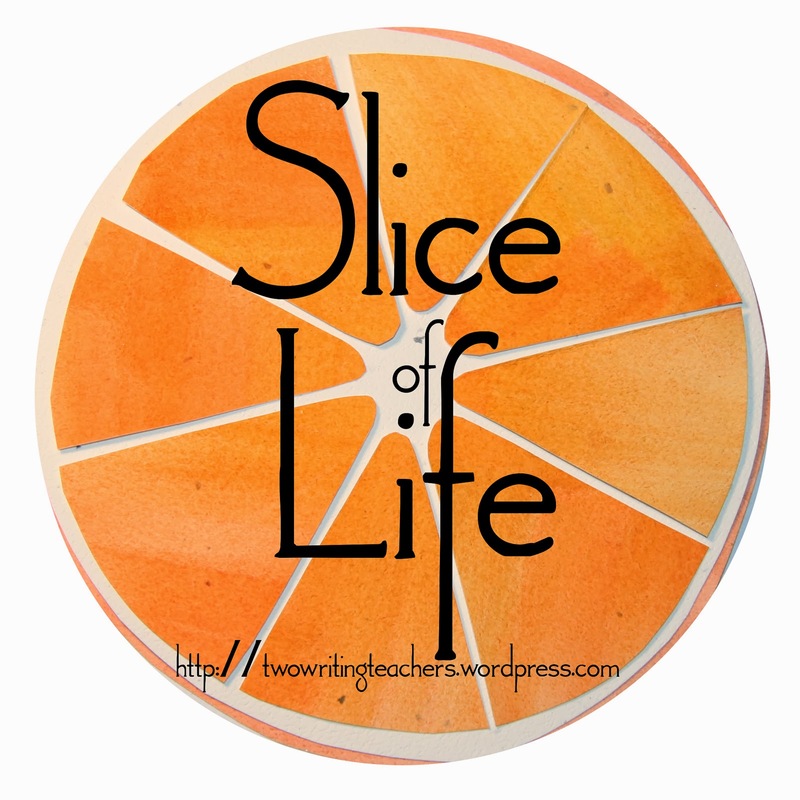 Tuesday SOL: What if we paint at the easel? Children are curious about the colors in the paint containers. We have begun the year with the three primary colors of yellow, red, and blue. As our school year continues, children will help me pick the colors for the easel, allowing for a more diverse palette. 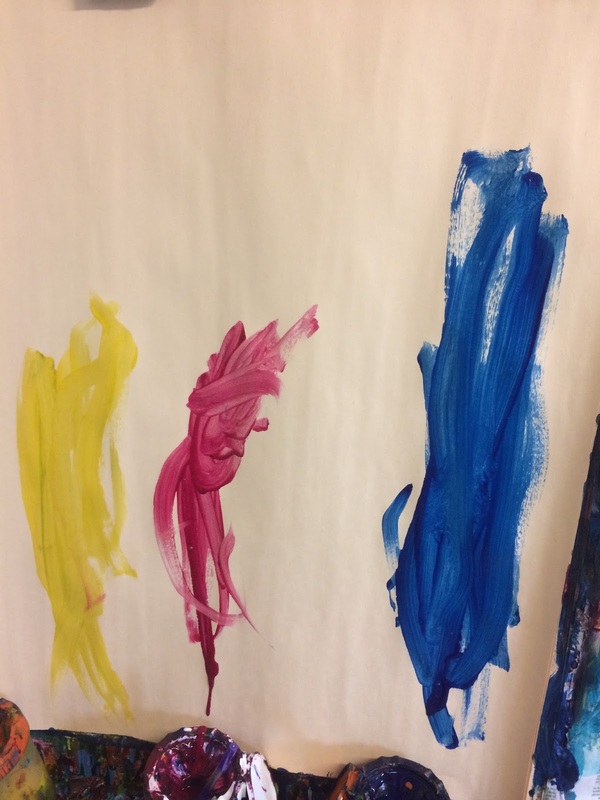 As the children learned in our guided discovery, our easels are set up with one brush for each color and children are encouraged to work with the same brush for the same color (in hopes of leaving a good solid color for the next painter). I love how frequently I find children's work that simply shouts "colors of the day." These two were painted many days apart, by two different artists. The paintings seem to ask, "What do we have today?" 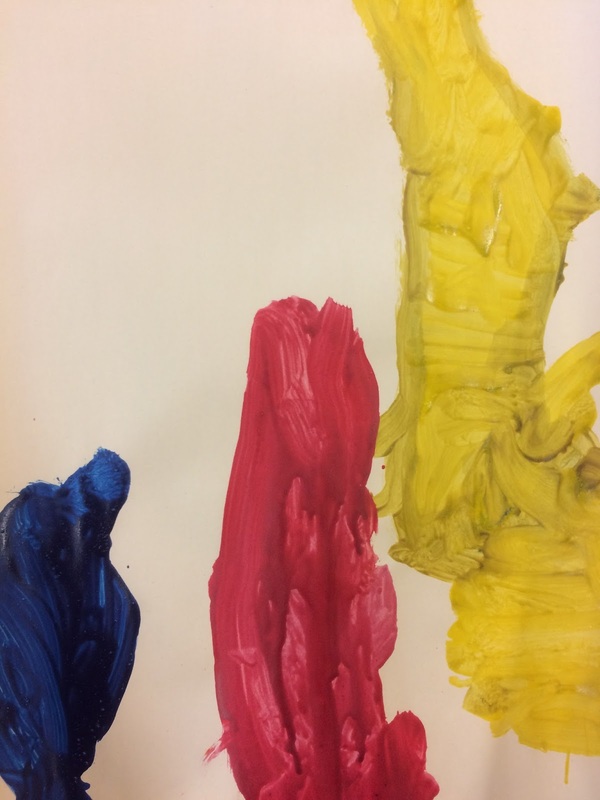 as the artists investigate what colors are available, developing one color at a time. But, of course, separate, distinct colors are not the only way to paint. 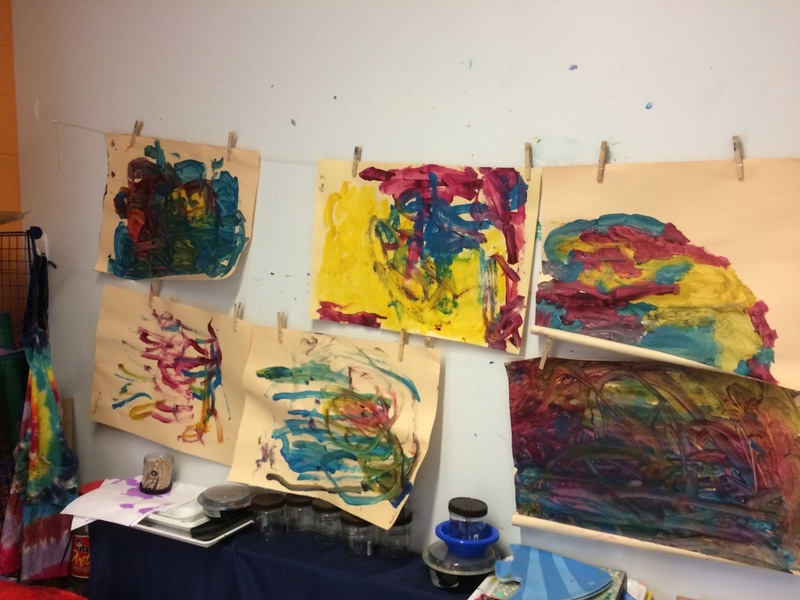 The very first week we painted, one introspective child discovered the thrill of covering every inch of the paper with paint. The preschooler worked quite a long time at this, mixing, swirling, stretching the paint. What was the original goal? To escape the tumult of the classroom and find a quiet spot to work alone? To discover what happens if you mix two colors? Was it simply to use up all the paint in the containers? Or maybe to create a puzzle for the teachers by covering one's name entirely? This early investigation has led to much imitation - daily, someone paints every bit of their paper at the easel. 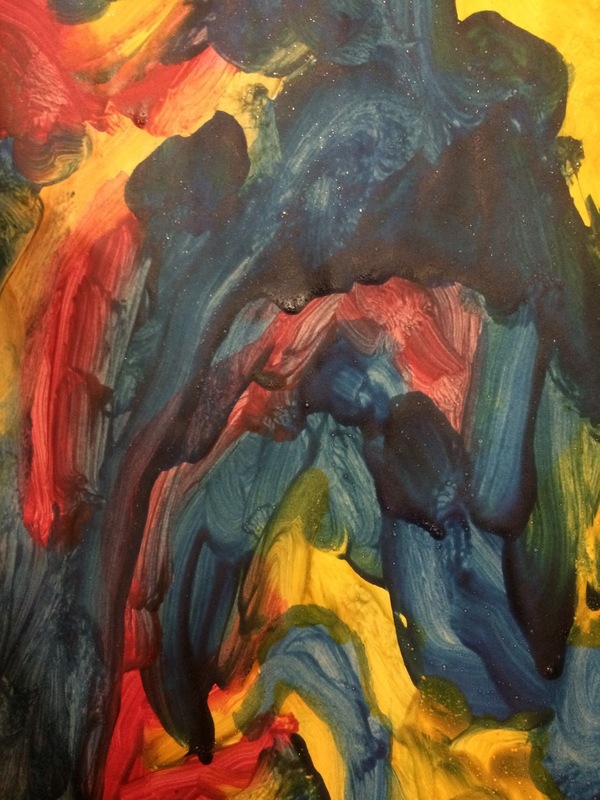 It is as if the preschoolers have an insatiable thirst for painting, it is never enough. Alas, the three colors are no longer distinct...however, the art is magical! 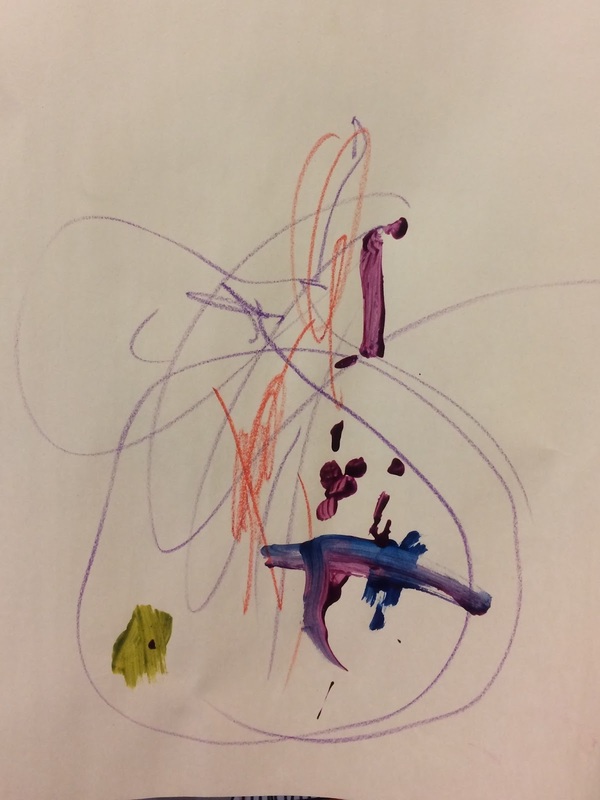 This next picture is one I call "The surprise of working together" - here, one child was drawing with pastels and wandered away from the easel. Pretty soon thereafter, another preschooler came over and began painting on the same paper. In these early days, children are developing their agency - just beginning to realize how to ask a teacher for a new piece of paper, how to move one child's artwork off the easel, how to ask a friend if they can work with them on art. I loved the combined effort! However, both children seemed surprised at the idea that their art was shared. As the year continues, children will begin to purposefully create art together, but this magical piece was happenstance. This beautiful artwork celebrating the color red was created during our classroom clean up. Yes, this clever preschooler slipped to the easel corner of the classroom while our clean up song played and classmates were busy tidying up the room. The preschooler successfully evaded teachers' eyes, as we focused on putting away blocks, dolls, and other toys. I call it "The Art of Avoidance" and it makes me smile - it does show good focus and persistence. I happened upon this masterpiece early one morning, as children were just arriving for school. 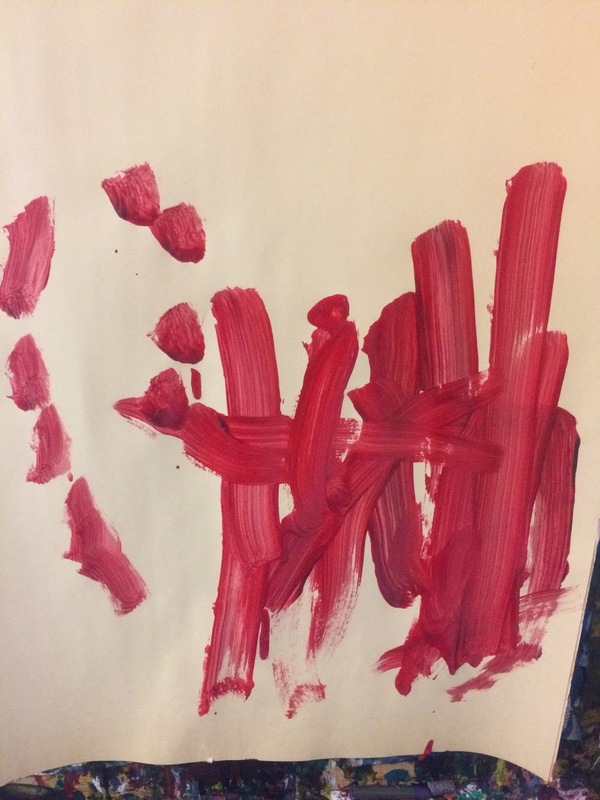 It had clear lines and a distinct silhouette - not at all typical for my preschoolers. I asked the artist, "What are you painting?" and he answered emphatically "An elephant!" Well, yes, it was! I hurried over to my Teaching Resident and whispered, "Did you see the painting at the easel?," realizing we were working with a budding Picasso...and she said, "Oh yes! His father painted the contour of an elephant for him when he dropped him off." I had a good laugh! A fabulous artwork of family love and connection. Preschoolers love to paint! Each day, our art corner is simply bursting with their creativity and imagination. Such amazing artwork! We still have many of Isabelle's preschool paintings hanging in her "garage gallery." I still have a couple of my own boys' paintings - and my youngest is 22! I love them. My own children had an easel, then passed on to the grandchildren. I like what you've written about focus because I remember their dreamy looks as they brushed on the paint, stood back, deciding what was going to be next. And these drawings, unique to each, mean something to them. We may not always understand, but as you've so beautifully explained, the art is there, the experience on paper. Lovely! I love looking at their paintings, seeing their creativity. I know the papers add up for families, with some children painting a new piece every day. I encourage the families to use these as wrapping paper! Very special! I love the way you analyze each piece of art w/ the voice of a curator. These budding artists will bloom as you whisper to them encouragement and acceptance of their artistic visions. Now about that elephant: A process of deconstruction infuses it w/ subtexts relevant to the political landscape! How apropos. These artists are definitely blooming - and I feel pretty (happily) irrelevant to their artistic process...but it is a delight to observe. The elephant keeps making me chuckle! I've read it during the holiday season for many years, and like to do preschool lesson plans to go along with it! Tuesday SOL: What is death? Tuesday SOL: How to say goodbye to our family?